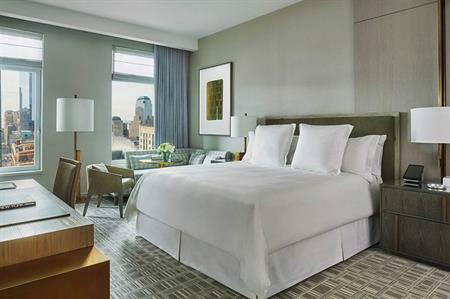 Four Seasons has unveiled the 189-room Four Seasons Hotel New York Downtown in Lower Manhattan's Tribeca neighbourhood. Designed by Soho and Toronto-based design studio Yabu Pushelberg, the five-star property is located just steps from Wall Street, the World Trade Center and the Oculus, the city's new $4bn train station. It’s also close to designer shopping in Soho, nightlife in the Meatpacking District and the city’s waterfront. In addition to a 24/7 dinning concept, there is also the option for groups to visit CUT by Wolfgang Puck, the celebrity chef’s first Manhattan restaurant located inside the hotel. The property is also home to a large fitness centre and ballroom, with events space for up to 175 geusts. "Downtown New York has been reborn as the most vibrant neighbourhood in city," said Peter Humig, general manager of the new Hotel. "It’s no longer simply a business district. You can feel the energy the minute you arrive, and we are proud to be in the heart of it."